(Nanowerk News) Researchers from North Carolina State University are using a technique they developed to observe minute distortions in the atomic structure of complex materials, shedding light on what causes these distortions and opening the door to studies on how such atomic-scale variations can influence a material’s properties. 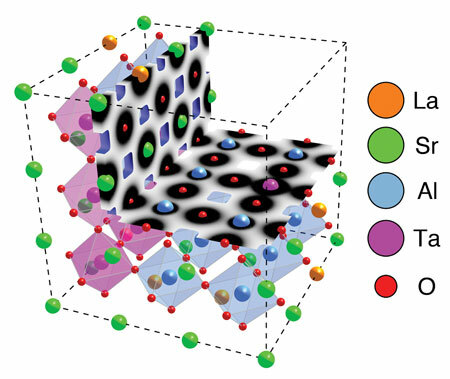 Researchers have known for years that the properties of complex materials, such as alloys, are influenced by how the material’s component atoms are organized – i.e., where the atoms fit into the material’s crystal structure. But the devil was in the details. “We knew where the atoms were on average, but we also knew that there were variations in a material – there can be significant displacements, where atoms don’t fit into that average pattern,” says Dr. Doug Irving, an associate professor of materials science and engineering at NC State and co-author of a paper describing the new work. 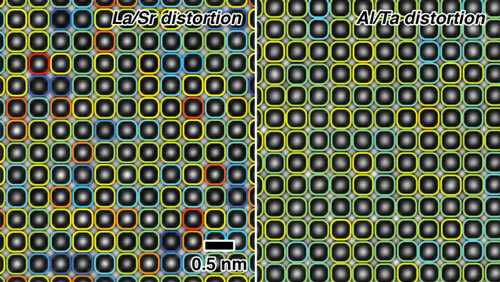 “However, detecting these distortions required indirect methods that could be difficult to interpret, so we couldn’t fully explore how a material’s atomic structure affects its properties,” says Dr. James LeBeau, an assistant professor of materials science and engineering at NC State and corresponding author of a paper ("Direct observation of charge mediated lattice distortions in complex oxide solid solutions") describing the new work. To test the technique and learn more about the links between structural distortions and chemical bonds, the researchers looked at a complex material called lanthanum strontium aluminum tantalum oxide (LSAT). They picked LSAT because there is significant variability in the nature of the chemical bonds within the material. “We never would have been able to directly see the extent of that variation before,” LeBeau says.